PublicUs has proven to be one of the most important restaurants in Vegas for not only setting new standards of quality and style in a coffeehouse, but also pushing the boundaries of how far east you can go on Fremont St while still drawing loyal customers from the "good part" of Downtown. Unlike most coffee joints, there's no giant price list hanging on the wall. Instead, you'll be greeted and guided by the staff with suggestions and printed paper menus. There's also no condiment station. That's because the baristas craft your drink with precision, like a bartender would with a quality cocktail. This place even has its own version of an Old Fashioned: served in a rocks glass with espresso shots, aromatic bitters, cherries, simple syrup, and an orange peel over an ice sphere. 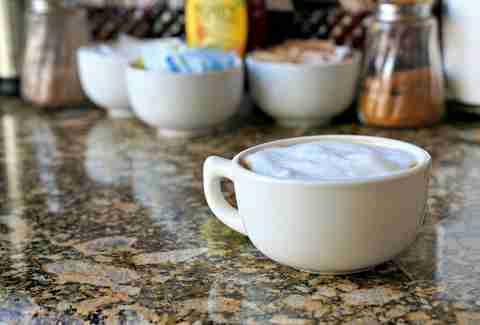 Another favorite is the macadamia latte with real ground nuts instead of a flavored syrup. Ask for it with house-made almond milk. 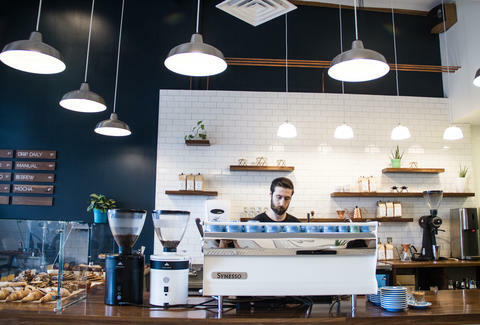 With a nice mix of traditional and eclectic coffee creations, Makers & Finders is one of the best things about the growing Downtown Arts District. It has an espresso machine that was bought for the price of a small car and lattes crafted with house-made syrups. Top choices include a coconut-turmeric blend and "Mexican Spice" with four actual dry spices in the mix. 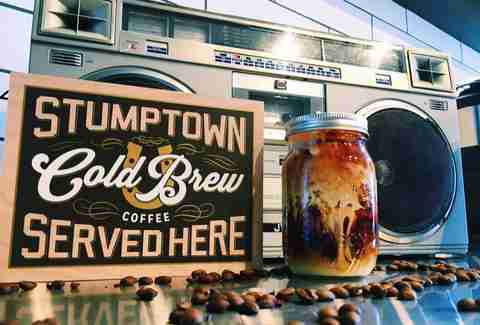 The cold brew takes about 16 hours to make in a multistage process and the food menu draws inspiration from Latin America (definitely try the Sunday brunch). Every hot coffee is made with a pour-over, so it could take a few extra minutes to get your cup when things are busy, but it's worth the wait for every delicious drop. Tucked in the corner of the Village Square shopping center, Avery's roasts its own beans twice a week, with anywhere between nine and 13 varieties of coffee from regions around the world. The team recently perfected a Zimbabwe-sourced nitro brew that is among the best in Las Vegas, and when fall rolls around, Avery's has not one, but three different takes on the highly-coveted Pumpkin Spice Latte. No fancy lattes here. 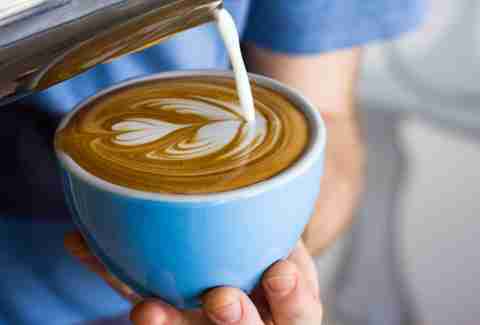 Mothership is bare bones and all about the craft and culture of brewing coffee. The menu is kept simple and much more in line with a classic espresso bar than what you'd expect at the big chain coffeehouses. Mothership is also a wholesale roastery that sells beans to other shops in the valley, but the fun part is taking advantage of the education offered by the knowledgeable staff and learning about the science of coffee. 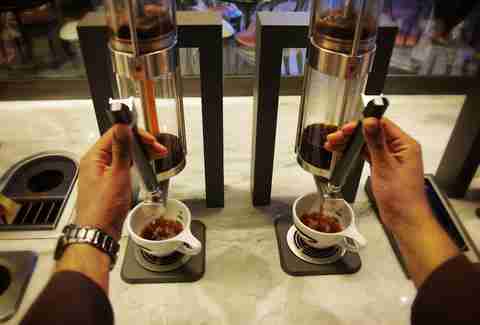 It's the kind of place where you might see the same bean brewed two different ways on the same day -- just for the sake of experimentation. Don't overlook the nitro coffee made with hops or the organic, vegan, and gluten-free pastries made with seasonal ingredients. The owner is hands-on when it comes to sourcing beans, making regular trips to his native Brazil where about 60% of the selection comes from (although other regions such as Kenya, Mexico, and Colombia are also well represented). The Sambalatte location at the Monte Carlo is the only coffeehouse on the Strip to roast its own beans and is supervised by a team of experts and a high-tech computer system. The lattes and cappuccinos are delicious but your best bet may be to enjoy the coffee in its own elegance from a steampunk machine. It's kind of like a supercharged French press without the long wait. It extracts the flavors, bringing out different shades in each taste as the coffee cools off and changes temperature. 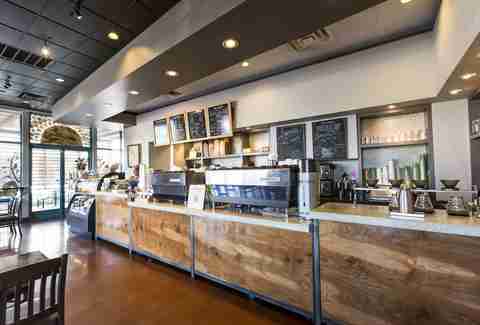 Two additional Sambalatte locations can be found in the west valley. 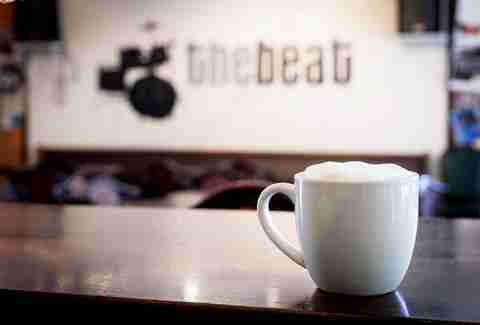 A coffee shop and record store all rolled up in one, The Beat is a popular hipster hangout in the Fremont East district, with regular nights of music, standup comedy, poetry, and indie movie screenings to keep you entertained. If coffee isn't your thing, beer and other booze is served after 7pm. Or how about a shot? 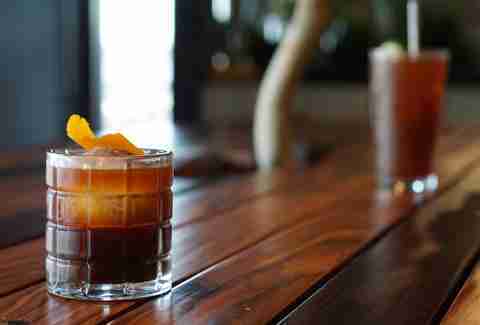 The "Wake Up Call" blends espresso, dark rum, cream, and a choice of flavored syrup for the perfect caffeine kick. Mothership's older sister location shares the same owner but operates as a separate company with a different attitude and agenda. Sunrise is more of a social hub with a shaded outdoor patio and tables inside that eagerly await your open laptop. The baristas are encouraged to experiment with the coffee here, so new creations are added to the menu every season (the profits are split with the employees who invented them). Sunrise is also the oldest independent coffeehouse currently operating in Las Vegas, thanks in part to its reputation as the perfect meeting spot. There's nothing wrong with making coffee fun. The lattes here -- which come hot, iced, or blended -- look like desserts but aren't as sweet as you might find at other places. The caramel latte, for example, uses a "sauce" instead of a "syrup" to keep the flavor smooth without an overwhelming sugary bite. If you prefer to go in a healthier direction, there are a few fruit juice blends on standby, like "The Selfie," which mixes pineapple, mango, banana, and spinach with coconut water. Just want regular ol' coffee? You have the choice of brewed, pour-over, or French press. Grouchy John himself is a self-confessed Star Wars freak (original trilogy only) and the influence can be seen in some of the artwork and drinks named after Yoda, Lando, and Chewbacca. If that wasn't fun enough, stop by on your birthday and get a free coffee of your choice with whipped cream and sprinkles. 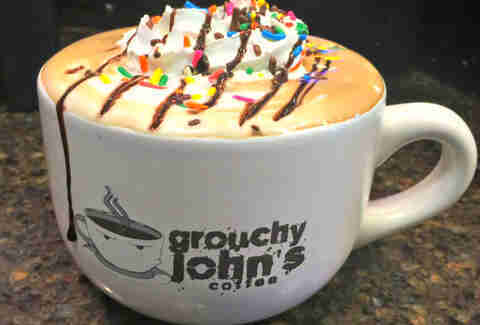 Grouchy John's also does it's own version of Bulletproof Coffee, made with grass-fed butter and MCT oil, to give your brain a healthy fat-fueled focus for a few hours. Keep your eyes peeled for their food truck around town as well. A coffeehouse with a Harry Potter theme because... well, a lot of people like Harry Potter. That includes the owners of this shop, who don't skimp on quality while going big with gimmicks. Open for less than a year, Bad Owl has already made more than a few loyal fans, such as Bad Beat Brewing. The Henderson neighbors recently joined up to make a coffee stout with beans from Ethiopia. 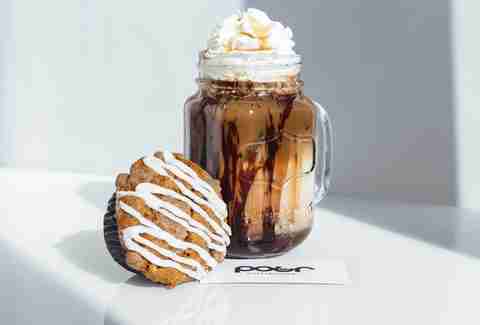 House favorites include a cookie butter latte and the "Butter Brew" -- a latte with a sweet kick of butterscotch. More of a place for dessert lovers than coffee snobs, Amorino has made a name for itself in a number of countries around the world but is now opening its US flagship location in Las Vegas at The LINQ. 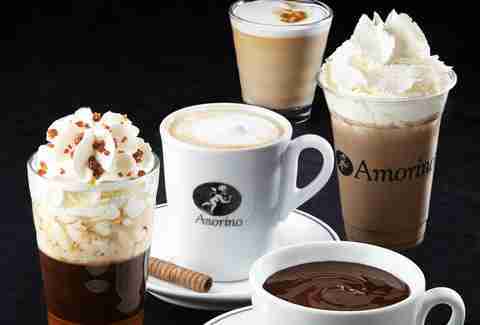 Amorino compliments delicious gelato and macarons with bold Italian espressos and cappuccinos. In case you need a little variety, there are also 10 different versions of cioccolata calda (or "hot chocolate" for all you English speakers). You can also find Amorino at the North Premium Outlet Mall. The only place in Las Vegas to serve the full line of Portland's Stumptown coffee has a unique interior best described as "industrial chic," with painted concrete floors, track lighting, and tables where every seat has a clear view of the baristas in action. Opened recently by a father-and-son team, there's no shortage of fun stuff, with waffle shots, nitro ice cream floats, and a bananas Foster latte at the top of the list. Espresso and cold brew milkshakes are being developed as well, but don't worry, there's a full menu of traditional drinks for all the coffee purists out there. Rob Kachelriess has been writing for Thrillist for nearly three years. He wrote most of this story while chugging a Macadamia Nut Latte from PublicUs. Follow him on Twitter @rkachelriess.